The Inside Out Lesbian and Gay Film Festival in Toronto screened one of my short films last night. 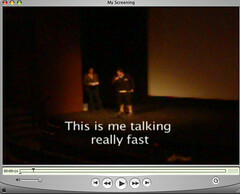 Here is the screening with some bonus footage of me on stage talking really fast. I need to take some lessons in chilling out, slowing down and being comprehensible. Congrats! It sounds like they liked you film! than viewing your own bootleg version of it.